Donnington Recreation Ground is an area of mown grass approximately 2.6ha in extent owned by Oxford City Council. It is bounded to the north by the Boundary Brook, to the east by Cavell Road, to the south by disused playing fields belonging to the former St Augustine’s secondary school, and to the west by Meadow Lane. Topographically it is situated at between 56 and 57.5 m OD on the southern side of the floor of the shallow valley of the Boundary Brook, close to its confluence with the river Thames. Solid geology comprises late Jurassic mudstones of the West Walton Formation, overlain locally by Quaternary sands and gravels from the first terrace of the river Thames/Boundary Brook (Northmoor Member). Although no previous archaeological investigation had been carried out on the recreation ground it was identified as having good archaeological potential. The site is one of the few areas of the Thames gravels in the East Oxford area to have not been disturbed by building, quarrying, tipping or leveling. There is also evidence of activity from most periods between the middle Palaeolithic and the Post Medieval period has been found within a 500m radius of the site. The Archaeology of East Oxford Project carried an extensive magnetic geophysical survey of the site in summer 2012 (report forthcoming). The survey showed that much of the site is unaffected by ferrous contamination and produced good clean results. A number of possible archaeological features were identified and particular attention has been focused on a sub circular feature approximately 10m in diameter and enclosing an area of slightly over 5.5m in diameter. The feature consists of a ring of 7 magnetic anomalies, each approximately 2 to 2.5m in diameter with an apparent gap in its south eastern edge. This feature bears a strong resemblance to a number of monuments of mid to late Neolithic date found in association with the Dorchester-on-Thames cursus, approximately 10km the south east of the site (Atkinson et al.1951; Whittle et al. 1992). Although slightly smaller in size the Donnington Recreation Ground feature is most similar to Dorchester Site IV, a circle of 8 pits with a gap on its south-east edge (see figure 7). Originally interpreted as a cremation cemetery (Atkinson et al. 1951, 35), Gibson (1992) suggests that the monument was a timber circle with each pit originally holding a post and that the deposition of cremated human bone was a secondary act. Asymmetric silting in the upper fills of the pits indicates the presence of an external bank enclosing the monument (Atkinson et al. 1951, 40). In summer 2013 the project carried out two further targeted detailed geophysical surveys of the site, a static point gradiometer survey and a close interval earth resistance survey. Both surveys added further clarity and detail to the features observed in the initial survey (report forth coming). Based on the results of this survey the project applied to Oxford City Council for permission to excavate a small trench over part of the circular feature in autumn 2013. 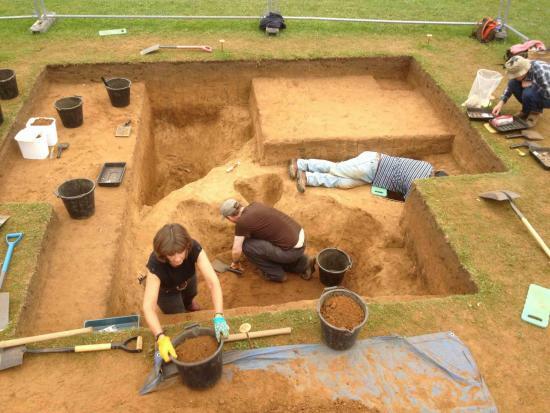 A small trench was excavated covering two of the pits identified by the geophysical survey in early October 2013. During the initial removal of topsoil and plough soil significant quantities of Romano-British and Medieval pottery were recovered. The Romao British material is likely to reflect an as yet undiscovered Roman setlement close to the excavation. The Medieval material is likley to be derived from the manuring and cultivation of the area during the Medieval period. In addtion to the ceramic finds a large number of worked flints were recovered from across the area of the trench. Once the topsoil and remnant plough soil were removed, the tops of two pits were revealed cut into the underlying sandy geology. When fully excavated both pits measured over 2 metres in diameter and were over 1 metre deep. Both pits have been partially disturbed by animal burrowing and tree roots, and there is some debate as to whether the northern most pit is actually a tree throw hole rather than an archaeological feature. A substantial assemblage of worked flint of probable Neolithic date was recovered form the western pit in association with a dump of burnt material. It is hoped that samples taken from this deposit will produce material suitable for radiocarbon dating. Full analysis of the excavation results will take place over winter 2013-14 and will be made available on the project website. The Archaeology of East Oxford Project would like to thank Oxford City Council for their assistance in making this excavation possible. Atkinson, R.J.C., Piggott, C., and Sandars, N.K. 1951. ‘Excavations at Dorchester Oxon’. Ashmolean Museum: Oxford. Gibson, A.M. 1992. ‘Possible timber circles at Dorchester-on-Thames’. Oxford Journal of Archaeology, 11(1), 85-91. Whittle, A.W.R., Atkinson, R.J.C, Chambers, R and Thomas, N. 1992. ‘Excavations in the Neolithic and Bronze Age complex at Dorchester on Thames, Oxfordshire, 1947-52 and 1981’. Proceedings of the Prehistoric Society, 58,143-201.